Hanna-Tintina Conservancy is located in the vicinity of Meziadin Junction in northwest British Columbia, approximately 143 kilometres northwest of Kitwanga Junction and 62.5 km northeast of Stewart. It encompasses nearly the entire watersheds for both Hanna and Tintina Creeks, and contains steep timbered hillsides, alpine slopes, and extensive wetland complexes. 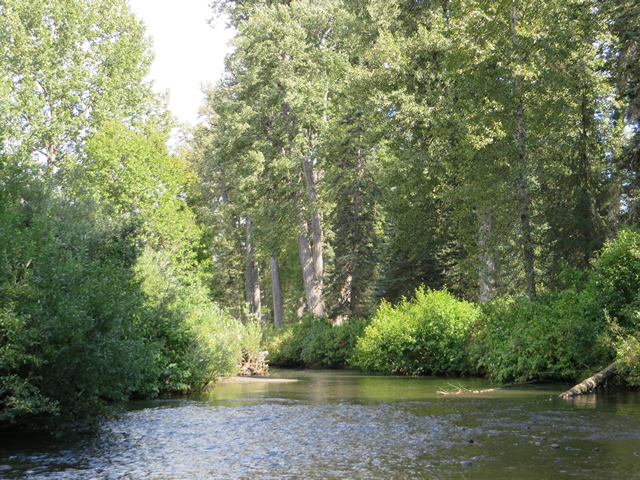 The Conservancy was established to protect the high value salmon spawning habitat in Hanna and Tintina creeks and along the shoreline of Meziadin Lake. Approximately 75% of the sockeye salmon in the Nass River watershed spawn in this area. The area also provides provincially significant grizzly bear habitat and high value moose winter range. The Conservancy is located within the asserted traditional territory of the Wilp Wii Litsxw of the Gitanyow First Nation; the asserted traditional territory of the Tsetsaut Skii Km Lax Ha; and the Nass Area and Nass Wildlife Area as identified within the Nisga’a Final Agreement. The Conservancy was established in 2013 as a result of the Nass South Sustainable Resource Management Plan and the Gitanyow Huwilp Recognition and Reconciliation Agreement. The Nass River is located to the east of the conservancy. Hanna Ridge forms the western boundary of the conservancy, rising to 1844 metres elevation, while Mt. Bell-Irving is the highest point on the eastern boundary rising to 1570 metres elevation. Meziadin Lake Park borders the conservancy on its southwest end at Meziadin Lake. Conservancy Size: 23,702 hectares – 23,480 hectares of upland and 222 hectares of foreshore in Meziadin Lake and Meziadin River. Hanna-Tintina Conservancy is located in the vicinity of Meziadin Junction and can be accessed by Highway 37 and 37A. Dease Lake – 312 kilometres on Highway 37. Kitwanga and Stewart are the closest communities. History: Between the 1970s and 2009, logging was undertaken in the watershed. There are old roads and trails throughout the Conservancy, many of which are now overgrown. Cultural Heritage: First Nations have a long history of use of the area. The high levels of use are a result of the high salmon and wildlife habitat values centered on Hanna and Tintina Creeks, and the resulting high subsistence and cultural values. The area is currently used for trapping, hunting, fishing, and collecting berries and medicinal plants. It was also the centre of a major trade route, with trails going north, south, east and west. Conservation: The floodplain of lower Hanna and Tintina Creeks is a very important ecosystem in the region. The area contains very valuable sockeye salmon spawning, rearing and overwintering habitat, is a critical grizzly bear feeding area because of the salmon, and valuable moose winter range. Rare ecosystems known to occur in the conservancy include four wetland ecosystems: Mountain alder – Red-osier dogwood – Lady Fern low bench floodplain (Fl02, Blue-listed); Sitka sedge – Peat-mosses fen (Wf51, Red-listed); Scheuchzeria – Peat-moss (Wb12, Blue-listed); and Shore sedge – Buckbean – Peat-mosses bog (Wb13, Blue-listed). Willow-thicket/riparian ecosystems were identified by First Nations as sensitive to development and as important habitat for moose and other wildlife. Wildlife: Fish species recorded in Hanna and Tintina Creeks include sockeye, Coho and Chinook salmon, bull trout (Blue-listed), Dolly Varden, steelhead, rainbow trout and prickly cculpin. Of these sockeye salmon are by far the most abundant. The Hanna and Tintina watersheds are provincially significant for grizzly bear habitat values, due in large part to the salmon runs. The lower Hanna and Tintina creeks provide for moose winter range and Hanna Ridge provides for mountain goat habitat. A number of fur bearers reside within the conservancy including marten, fisher (Blue-listed), wolverine (Blue-listed), ermine (weasel), mink, lynx, fox, coyote, wolf, muskrat and beaver. A new management plan is being developed for Hanna-Tintina Conservancy.